Not the greatest of sleeps either of us had; Tina got up at 4am to take pills for a headache, I just kept waking up throughout the night. I also snored throughout the night which didn’t go down too well with Tina and I should have the bruises on my legs to prove it. Although the hotel room is not on a busy road, there are still lots of city noises that wake you; sirens and car doors etc. Still the ear plugs helped a bit. We showered then went to the room next door for the complementary breakfast; croissant for Tina, coffee and juice for me, then we drove a short distance to park the car for the day in a municipal garage. The reason we had to park the car in a car park rather than leave it parked outside the hotel is because during the day there are parking restrictions everywhere allowing only a maximum of two hours parking in one spot. Whilst parking this way is free, it does restrict you if you want to spend the day without using your car. Parking in the car park costs around $12 per day. 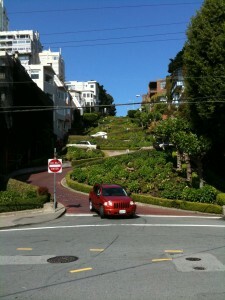 Once parked, we then walked downtown Lombard Street towards the city bus tour stop. We like using these tour buses as not only do they give you a guided commentary of the places you are passing, but also you can hop on and off at any point, using them as a taxi. 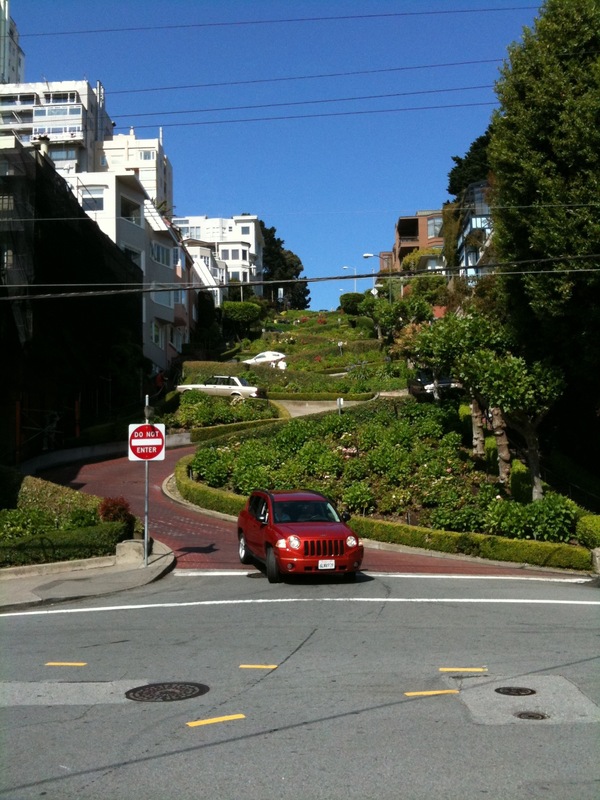 Before arriving at the stop we visited the famous Lombard Street winding road, that descends down a steep hill and is decorated with flowers, trees and bushes. This road attracts many visitors, both on foot and cars and in fact can take up to a couple of hours to queue to drive down it at times. It was fairly quiet when we walked down it. At the top of the road we also saw our first San Francisco cable car, with people hanging on like you see in the movies. It really does happen. We boarded the tour bus and started on the two hour ride around the city sights. Firstly we were driven through the Fisherman’s Wharf area, which is now mainly made up of small shops and restaurants. 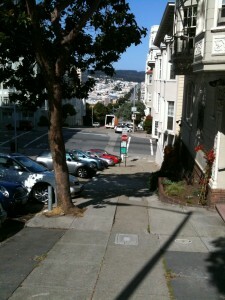 Then we drove down Lombard Street towards the Golden Gate Bridge. The tour guide gave lots of useful information and played songs as we continued our journey. 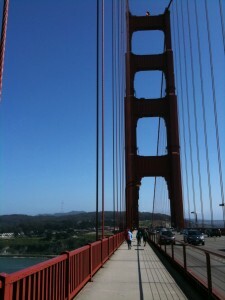 As we left the Bridge area he said the ride may become a bit more windy for a few minutes. He wasn’t wrong as we had to ride through a tunnel, which was extremely blowy. We then headed for the Golden Gate Park, a large expanse of trees and shrubs that was designed and built by a Scotsman in the last century. The area was just sand dunes prior his vision, but somehow he managed to create an amazing parkland area that would be worth visiting again sometime. The tour bus then took us through the area, Haight Ashbury which was famous for the hippy invasion of the 1960’s; too young for us to remember but we recognised some of the names he was stating that had lived there including Bob Dylan and Janice Joplin. As we drove on we then saw the magnificent City Hall, with gold adorn decoration atop the dome, Apparently this building was rebuilt after the 1989 earthquake that devastated much of San Francisco and now sits on rollers that will move the complete building by about 10 feet if another earthquake hits. The bus then headed towards the dodgy Mission Street area of the city, which the guide suggested not to walk, especially at night and then the financial district where there are many taller buildings. 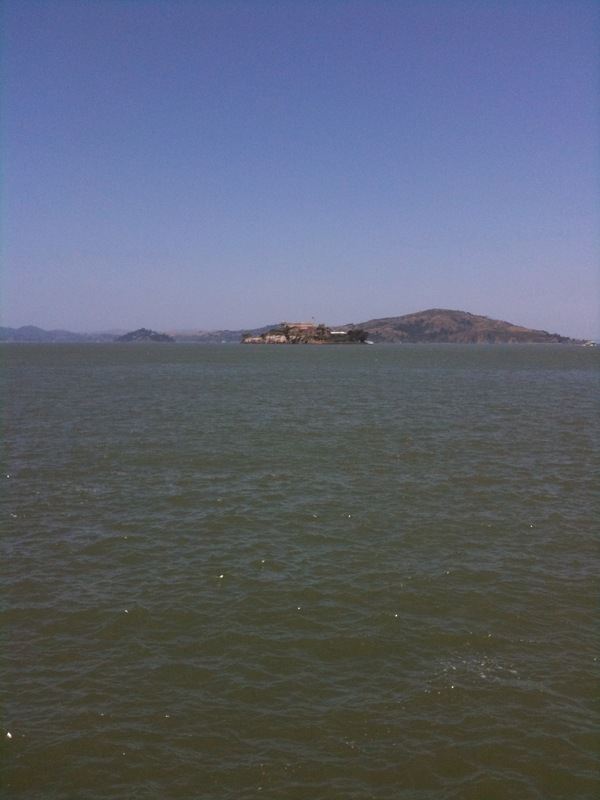 Shortly after we passed the famous Chinatown before heading back towards Pier 39 and Fisherman’s Wharf where we got off. As we passed through the Pier 39 area, we spotted a cafe called ‘Hot Spud’ so we made a beeline for there and enjoyed some lovely jacket potatoes, topped with all gluten-free bits as well. They even sold gluten-free sweet potato cheesecake so we bought a couple of slices to take out. 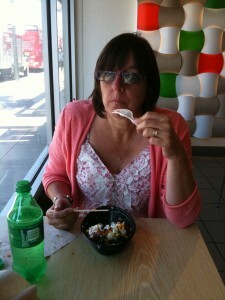 We walked the short distance to the pier area and sat an ate our cakes before strolling around the shops on Pier 39. 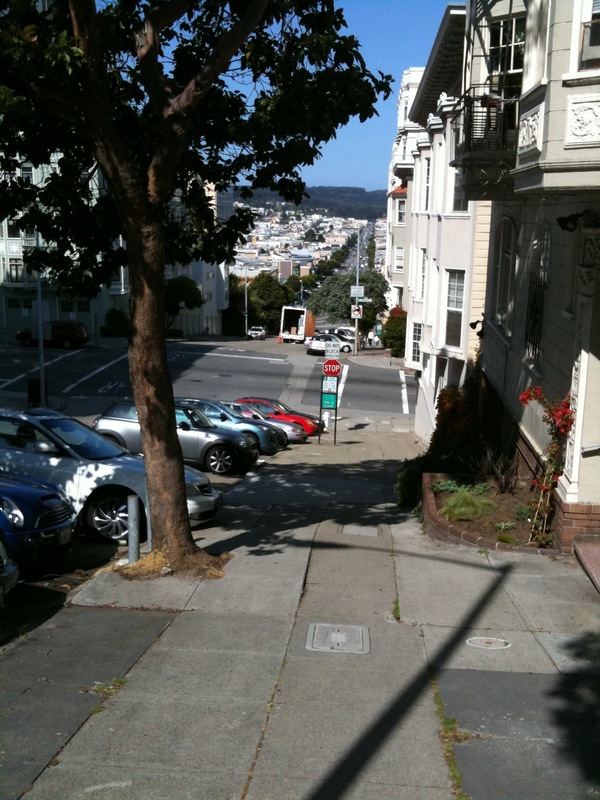 After buying myself a San Francisco t-shirt we walked for a while before rejoining the bus to take us back to the car and hotel. I then suggested we drive over the Golden Gate Bridge again and take a look around Sausalito. Unfortunately I parked in the wrong place and we didn’t discover the main area until we left the town and as we had little change for the parking meter, we headed back towards San Francisco. We paid our bridge toll fee and then parked up at the vista point on the south side of the bridge. Here I took a walk half way across the bridge, leaving Tina back in the car. 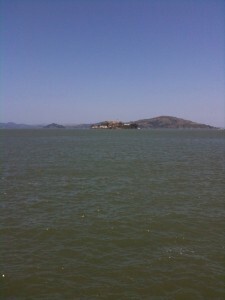 The views were fantastic; the bay was clear and you could see all of the city and Alcatraz Island. In the middle of the bridge there is a sign stating not to jump or else it would result in death. Your not kidding, it is miles down to the water. 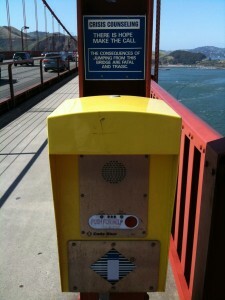 They stuck a telephone next to the sign offering counselling, I wonder how many people have been saved from jumping? We left the vista area and parked further down along the bay to get some further shots of the bridge before driving back to the hotel. Unfortunately we arrived there before the free street parking starts, so I had to go and find a space after the period began at six. As had been warned in the hotel writen reviews, parking in this area is at a premium and after driving for about half an hour with out success, I eventually parked the car back in the car park we had used earlier. It cost over $13 for a few hours earlier in the day, I dread to think what it will cost overnight! When I got back to the hotel Tina was about to leave a note and go and look for me as she was wondering where I had got to. I must remember to ensure any future hotels have parking on site. 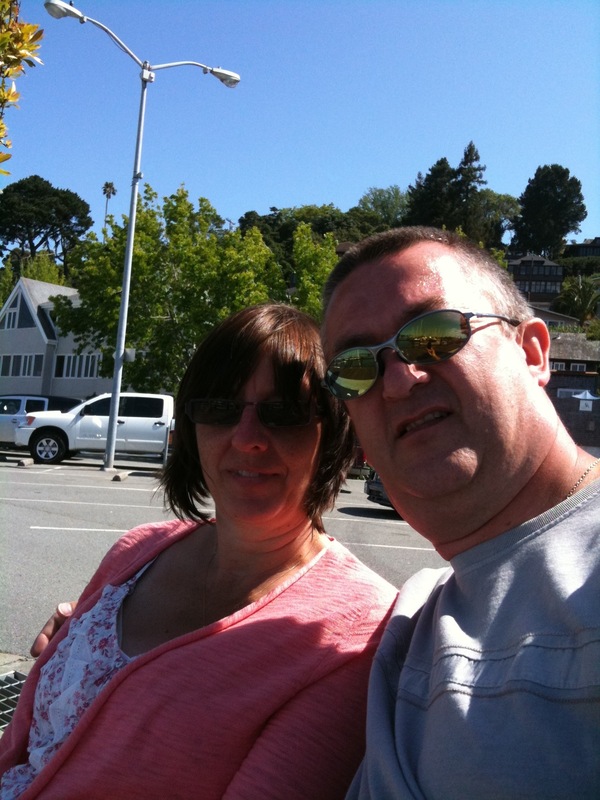 After a short rest we then went in search of some dinner, Tina had spotted an Indian restaurant just up the road so we strolled up for some eastern fayre. 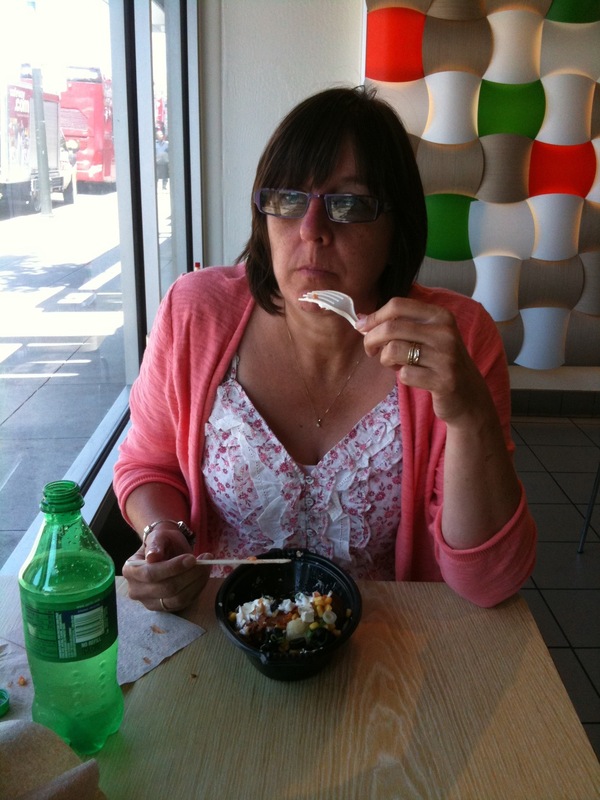 Whilst enjoying our curry, we discussed what we thought of San Francisco and whilst we liked what we saw, neither of feel that it’s a place we’d like to come back to. 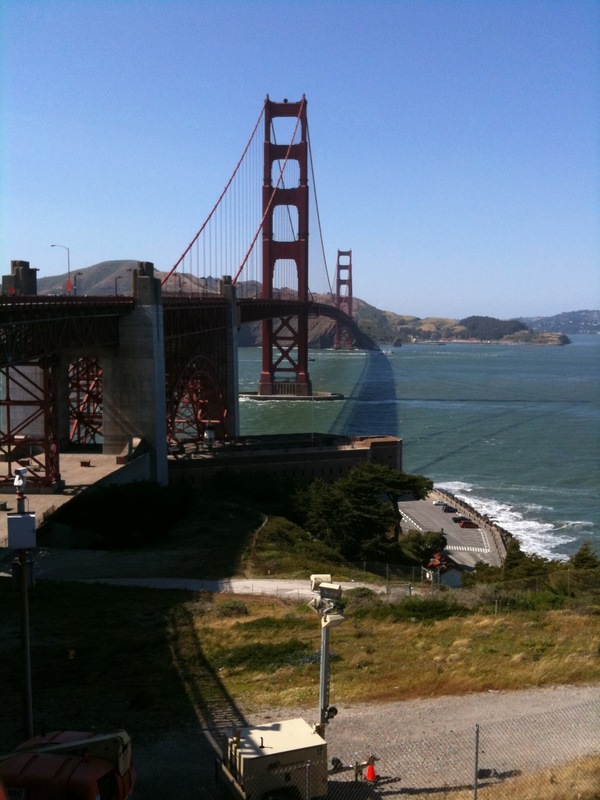 Yes, it’s good to see the cable cars, the wibbly wobbly road, the golden gate bridge and the famous hilly roads but we both felt that’s it not enough to revisit. Still we’re here for another day tomorrow so we’ll see how that pans out.